Well, we all know that workouts can make us strong and more powerful in terms of physical strength. But, do you know, exercises can also improve your mental health too? Yes, the same principle applies for brain or mind as well – that means, people who are mentally active they will be active physically as well and vice versa. Physical strength helps in improving mental strength or mental fitness, and mental well-being might improve your physical strength. Physical activities or exercises which are meant to improve your mental functions may help in keeping your brain active with proper circulation of blood. We know that proper blood circulation improves memory, cognitive abilities, coordination, balance, agility and alertness. Physical activities or exercises can also help in preventing age-related degenerative diseases of the nervous system. Expert says that increasing your activity levels from doing nothing to exercising at least three times a week, will reduce the risk of depression up to 30 per cent with a short period of time. Any exercise that promotes mental wellbeing is a great idea. You might have heard over time that walking or running or jogging is the best of the best exercises for your health. It may be of different names, but the results are amazing, it can light up your calories, reduce food cravings, and lowers your risk for heart disease. A few minutes walk daily in nature may even help you to live longer, say experts. Running almost calms you down instantly, if you have a fairly busy mind and prone to some pretty dark thoughts. Walking is very easy and simple so that moving your body, effortlessly and enjoyable. Physical activities have a huge potential to amplify our wellbeing. Even a short 10 minutes brisk walking can increase your mental alertness, energy and positive mood. Good running may help you to fall asleep easily at night which benefits your overall mental health and improves your memory, lowers your stress levels, and protects from depression. Many studies evolved over physical activity at different levels and their impact on people’s mood. Overall, research has found that aerobic exercise for 30 minutes daily is best at increasing positive moods like enthusiasm, alertness. It will keep your heart in good shape and keeps your brain active & healthy. Experts say that low-intensity aerobic activity is one of the best forms of exercise to procure positive thoughts and improving alertness. If you suffer from any physical health problems or prone to panic attacks, that can affect breathing can start with a gentle, low impact exercise which may be the best choice initially. Naturally, our muscles tense up when we are stressed. The slow, gentle movement of stretching calms down your mind and relieves from tension. Stretching is an effortless and effective way to reduce stress. Stretching can dramatically improve your body posture and guides your body and mind in a positive way. Active stretching is good for your muscles and also for your brain. Lots of videos are available online if you want to learn stretching or you can also perform the basic stretchings that you know. The main thing you should remember while stretching your body parts is that you should hold each stretch for a few seconds only – which will help to improve your blood circulation and flexibility of the joints. If you’d like to complement stretching and walking with something literally and mentally, yoga could be the dynamic choice. Yoga is best in the business for acquiring better mental health is because it integrates body and mind. Experts believe that yoga mainly focuses on breathing, which helps to slow down and calm your mind and also beneficial for your mental health because when you’re breathing deeply, it is difficult to be anxious. Yoga is like a gateway to people works deeply and helps them to understand what they need physically, mentally and emotionally. Practising yoga significantly decreases the levels of stress and anxiety. Meditation is being the most powerful form of mind training practices, where you can control your mind and take yourself to a different state where your soul meets your mind. During the initial stage of practice, it may be impossible to control your mind because of your tension, stress and problems which make you mentally unstable. But, practising continuously, you can gain control over your mind and body. Even a gentle practice of meditation has the potential to make people emotionally calm, mentally clear and more relaxed. You can notice tremendous changes like reduced blood pressure, lowered heart rate, deeper and calmer breathing by meditating at least 20 minutes a day. The Improvement in the blood pressure as a result of meditation helps to lower the risk of heart attacks. Meditation increases left-brain, frontal brain activity, an area of the brain related to positive mood. Interestingly, you can see improvements in the immune system as a result of the increased left-brain activity. Some studies proved that meditating long-term would increase the volume of grey matter in the right brain which is responsible for regulating emotions. 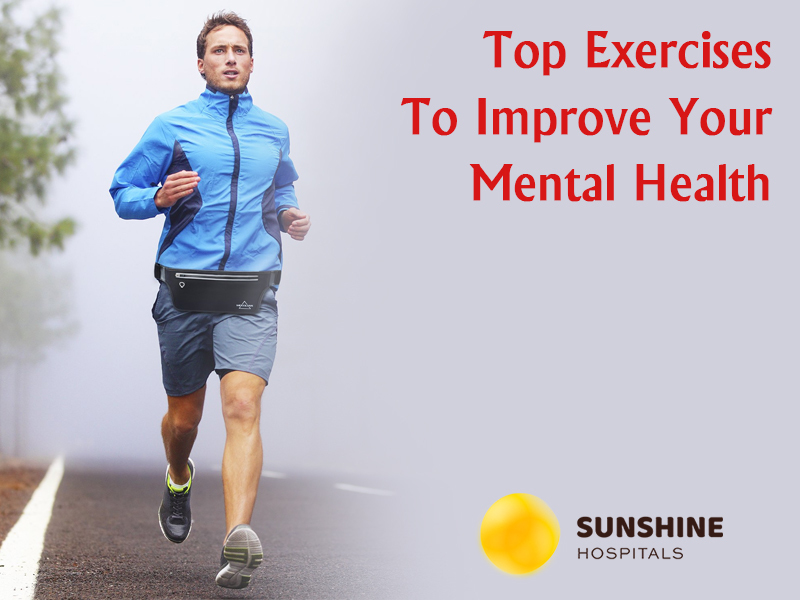 Along with these swimming, resistance training, cycling and playing different kinds of sports can also benefit to your mental health. It is recommended that on average, an adult should exercise 75 to 150 minutes a week. People who regularly exercise can acquire an enormous sense of well-being. They feel more energetic all day, have a better sleep at night and feel more relaxed and positive about themselves and their lives. In fact, it is powerful medicine for most of the common mental health challenges. Dr. Vikram Sharma is a Senior Consultant Neurologist at Sunshine Hospitals. He is one of the best neurologists in Hyderabad with more than 16 years of experience in neurology. With his immense experience as a neuro physician, he treats all types of neurological conditions including headaches, migraines, muscle weakness, body pains, back pain, weakness in hands and legs. He has done his MD, Dip. Neurology in London and FAAN in the USA. He also possesses hands-on experience in treating epilepsy and stroke patients.